HTML5 is the latest version of the well-known HTML standard, a language for structuring and presenting content for the World Wide Web. Now, this new version improves the language with support for the latest multimedia while keeping it easily readable by humans and consistently understood by computers and devices. These new abilities increase the power of the language and allow the developer to create lightweight applications, where user interfaces assume a leading role that was previously inconceivable. 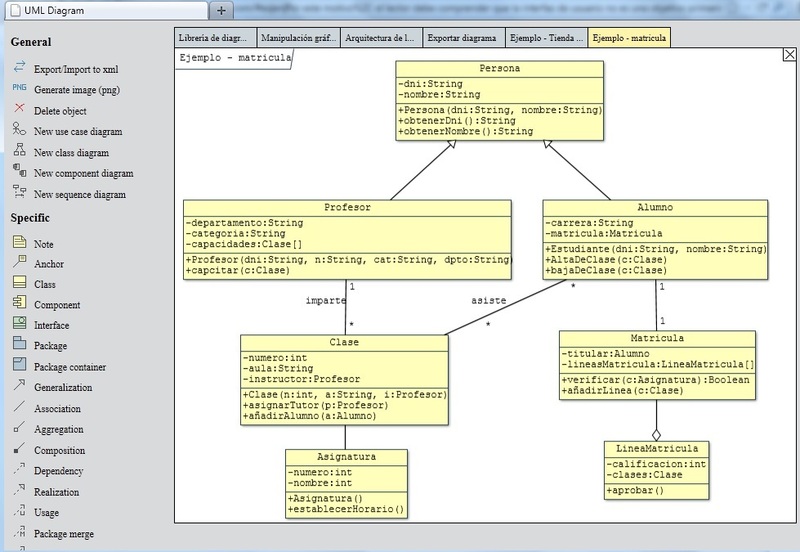 If you are interested in including UML diagrams as part of your application, just try this demo, which is a simple (but surprisingly complete) diagramming tool that shows some functionalities that jsUML2 provides. Notice that this editor is not conceived as a server-side application (it only contains client-side code), and no sophisticated user interface was developed, it just demonstrates the power of jsUML2. Your needs and imagination will do the rest. Programmers in different application domains often require long time to handle larger operations on data (e.g. reading or writing operations, running common algorithms or processing values). This is a common issue that requires a lot of effort from programmers. 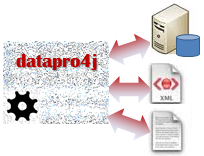 datapro4j is a Java API for processing data extracted from diverse heterogeneous sources (e.g. databases, files with different formats, Internet, etc.) making, for example, migration between data formats pretty easy: the programmer only needs to read values from one given format and then write them to another different one. The library permits the programmer to deal with tabular datasets, i.e. those datasets whose data are distributed into columns of different types, from numerical to categorical values. datapro4j has been constructed following five demanding design criteria: performance (operations on data are built following Java performance issues), interoperability (the library is conceived to be used with external data providers, services and tools), integrability (datapro4j will avoid a huge amount of work, as usual required for programmers that need to access and process values from different data sources), scalability (it can be easily extended to read new data formats, process more operations or access to other external interfaces and toolkits) and maintainability (the programmer can provide his own implementation of different processing parts, so adaptability to changeable requirements is guaranteed). No need to reinvent the wheel! If you are interested in using datapro4j into your code, this page contains great documentation and examples that will provide both an overall picture of and a more detailed information on the library and its scalability and integrability. 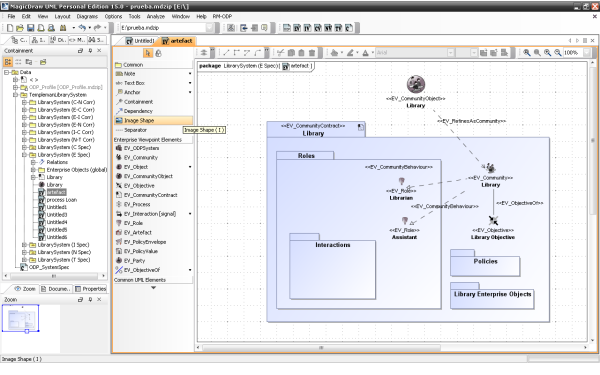 MagicDraw is a commercial visual UML modeling tool with teamwork support, which has demonstrated its versatility and usability in different domains, including those in the context of the EAFs. On the other hand, the Reference Model for Open Distributed Processing (RM-ODP) is a joint standard by ISO/IEC and ITU-T, which provides a coordinating and conceptual framework for the standardization of ODP systems. ISO/IEC and the ITU-T also started a joint project in 2004 known as UML4ODP, which allows ODP modellers to use the UML notation for expressing their ODP specifications in a standard graphical way; to allow UML modellers to use the RM-ODP concepts and mechanisms to structure their large UML system specifications according to a mature and standard proposal; and to allow UML tools to be used to process viewpoint specifications, thus facilitating the software design process and the enterprise architecture specification of large software systems. This plugin aims to facilitate the development of ODP systems specifications according to the guidelines provided by the ISO's UML4ODP normative documents, and it is fully integrated into the MagicDraw's environment. © José Raúl Romero. 2014.